This podcast is about life in the medical laboratory and discusses issues that are important to the people who work there. We also will give you tips and support for some of the unique challenges of working in the medical laboratory and in health care. Although each episode will have a laboratory slant to it, many people working in health care may find the information useful and relatable. We'll be talking to subject matter experts in their fields, such as lawyers, union representatives and physicians, using their expertise to help you. If you want to connect with us, ask questions or give suggestions for future episodes you can find us on Facebook and Twitter @csmls. 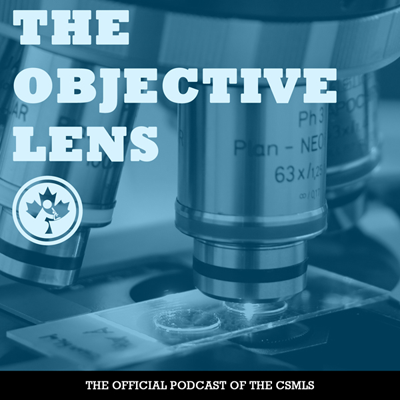 The Objective Lens is the official podcast of the Canadian Society for Medical Laboratory Science (CSMLS), the professional society for medical laboratory professionals in Canada. Season 2 is a wrap! In this season finale, your host, Cathy Bouwers, and co-producer, Michael Grant, reflect on their favourite episodes of the season, plan for future episodes and do a little humble bragging—The Objective Lens is officially an award-winning podcast. Be sure to share your thoughts and ideas with us. With its many challenges and sacrifices, life in the military as an MLT might not be for everyone, but for the right person it is an extremely rewarding opportunity of a life time. In this episode, we speak with Sergeant Jeff Scott, an MLT in the Canadian Armed Forces, about his experiences with enlisting in the armed forces, forming tight-knit bonds with his colleagues and providing humanitarian relief in Ebola-stricken Sierra Leone. Health care in remote and indigenous communities poses unique challenges. In this episode, we speak with professionals who are on the front line of northern and indigenous health care to gain insight into the obstacles these communities face, and how the lab can work side-by-side with them to resolve these challenges. Blood transfusion medicine has come a long way since its early beginnings in 1492. In this week’s episode, we speak with industry experts across Canada to delve into exciting research in the field of blood and learn how innovation and communication in the lab saves lives. Science can learn a thing or two from art, especially when it comes to public education. In this episode, we speak with a biomedical artist and a microbiologist media entrepreneur to discuss alternative tools to improve science literacy and public outreach through fun, easy-to-digest artistic mediums, like dancing, painting and mobile app gaming. Did you know that April is World Autism Month? In this bonus mini episode, we speak with Louise Nagy, National Director of Community Engagement and Environmental Sustainability at LifeLabs, about LifeLabs’ Serving Customers with Autism program. This program combines customer services and lab services to help improve patient care for people with autism spectrum disorder. Do you ever find yourself wondering how you can foster top talent in your medical laboratory? Or are you looking to advance your career but need a little help? In this episode, we speak with industry leaders to learn effective strategies for all medical lab professionals to develop top talent who can then go on to make great contributions in the healthcare industry. The game of baseball and the medical laboratory have more in common than you may think. They both need to communicate strategically with all members on their team to ensure they get the job done. In this episode, we talk with lab professionals and a communications expert to learn how MLTs and MLAs can proactively improve patient care by understanding and implementing clear, respectful intraprofession communication strategies in their day-to-day interactions. How are we meeting the training needs of medical laboratory students with less opportunity for hands-on experience? In this episode we discuss the use of simulation as a viable way for students to practice critical skills in a risk free environment. We talk to educators, program graduates and the CEO of SIM-one Canadian Network for Simulation in Healthcare, to discuss the role simulation plays in education. Listen in to hear a very compelling discussion about how this growing learning model fits with the need for clinical education. Have you ever called in sick to work with a cold, when in reality you needed a mental health day? In this episode, we discuss the importance of having open dialogue about mental health issues. CSMLS Researcher Laura Zychla reports on the research she conducted with medical lab professionals. We also discuss the CSMLS Mental Health Toolkit and other strategies to help deal with workplace stress that can impact your mental health. Gwyneth Paltrow can sell an $85 bag of crystals that can treat infertility? Unfortunately the over 1.8 million monthly readers of her website are buying it up with a lack of full scientific disclosure. Jason Tetro, widely known as The Germ Guy, speaks about the challenges with the public’s understanding of science, conflicting studies and using small amounts of science to sell a product, as Gwyneth does so well. He discusses the need for more educators in all areas of science and how you (yes, you!) play a part in his mission to communicate science accurately. We’re back and ready for another season of the Objective Lens where we take a closer look at life in the medical laboratory. This sneak preview gives you a taste for the upcoming season. Join your host, Cathy Bouwers, together with co-producer Michael Grant, as they discuss the topics and interviews we are excited to bring to you in the coming weeks. Be sure to subscribe to The Objective Lens through iTunes and Google Play so new episodes are delivered to you directly. In this last episode of season 1 of the Objective Lens, we take a minute to reflect on the development of this podcast. In conversation with co-producer Michael Grant, we discuss highlights from previous episodes, chat about our creative process and plan for future seasons. Do you consider yourself an advocate for the medical laboratory profession? You should. In this episode we discover how everyone can be an advocate and it doesn’t always include standing on a soap box. We speak with several CSMLS members who have used their voice to contribute to the advocacy movement on behalf of the professional community. Leadership is not the same as authority. In this episode we explore the topic of leading without authority, which is really about the art of influence. Take a listen and you might find that you don’t need that title, in order to be a leader after all. This week we talk to a writer well versed in the art of influence, explore the history of a Latin phrase and take an interesting tangent into the science of smiles. Oh, and there’s a couple references to Jeopardy too. Trust us, this will all make sense. Do you remember the feeling of starting a new job and getting frustrated by the unwritten rules of the workplace. In this episode we are discussing workplace culture, specifically in healthcare. We talk to a dispute resolution expert on the current state of the culture in healthcare and we speak with an HR professional on the importance of defining the culture. More importantly, we learn how each individual employee is part of the solution when it comes to improving culture. The CSMLS team is busy in Ottawa today advocating on behalf of medical laboratory professionals. Here’s a quick behind the scenes look at lobby day. We’re back with a new episode next week. Volunteering within your profession can be both personally and professionally enriching. Learn from several CSMLS volunteers and how their willingness to help have led them on a journey to unforgettable experiences, exotic places and lifetime friendships. In this episode we take you on the winding path towards leadership. We speak with two senior lab professionals who both took very different routes when they moved from the bench into leadership. We highlight some tools needed for success and the potential pitfalls that can occur along the way. We also examine the need for organizational support for young professionals with leadership potential. Have you ever had to deliver negative feedback to a coworker? Or tell someone their behaviour needs to change? Have you had to speak to someone about their work performance? These are not pleasant conversations. In this episode, we tackle the process of having a Difficult Conversation. We spoke with experts who give their best tips for having an open and honest conversation, even when the topic might be challenging. We also spoke with several Lab Managers, who spoke about their own experiences and give their best advice on having a difficult conversation at work. This episode is the second part of our two-part discussion on bullying in the workplace. In this week’s episode we look at how to know if you are being bullied, delve into the complaint process and explore how improving workplace culture can curtail bullying. We hear more advice from union representatives and speak with an employment lawyer on the legalities of this issue. We will also look at the duty of a witness when you see a colleague being bullied. PPE can’t protect us from the way we treat each other. In this episode, we will look at bullying in the workplace. We talk with experts to get a better understanding of how this issue is affecting health care professionals and why hospitals can be a breeding ground for bullying. We also take a look at one program that is doing its best to combat bullying. In this episode, we take a look at workplace stress within the context of medical laboratories. We talk to a doctor specializing in stress management and give you some strategies for managing your own stress. We also look at what employers and managers can do to create healthier workplaces. We also speak with one LifeLabs manager about what he is doing to facilitate better communication within his team and how that helps alleviate conflict and stress. In this episode, we introduce you to the official podcast of the Canadian Society for Medical Laboratory Science — The Objective Lens.